Elizabeth Andoh was born in New York, but has made Japan her home since 1967. 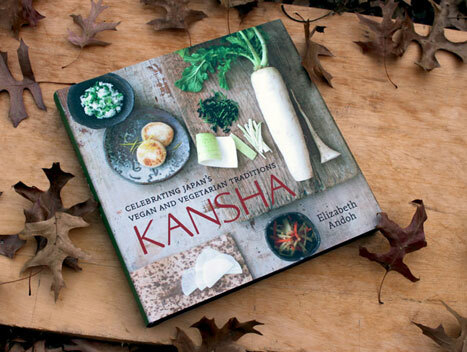 A graduate of the Yanagihara School of Classical Japanese Cuisine, Elizabeth is the author of four books on Japanese cooking, including two International Association Culinary Professionals award winners, AN OCEAN OF FLAVOR and WASHOKU: Recipes from the Japanese home kitchen. She was Gourmet’s Japan correspondent for more than three decades and was a regular contributor to the New York Times travel section for many years. Andoh lectures internationally on Japanese food and culture and directs A Taste of Culture, a culinary program based in Tokyo and Oska. Two years ago I heard Elizabeth on a PBS radio interview. I knew very little about her, then, except that I listened and liked her approach to cooking and ingredients. I have long been a fan of Japanese cooking. Having lived in California for twenty five years, I was quite exposed to good Japanese food, especially the kind served in sushi bars, but also the general fare of quality Japanese restaurants. After hearing Elizabeth speak, I decided to email her and ask if she had a recipe she would share for Hamachi Kama (braised yellowfin or bluefin tuna jaw,) my all time favorite Japanese dish. It is presented in a variety of culinary styles at Pacific Coast Japanese restaurants; a dish that is at once tender, tasty and succulent, as close to perfectly cooked chicken breast meat as fish can be, but with the extra-special flavor only fish enjoy. This dish enhanced by lemon juice is really spectacular. The enjoyment of picking the meat from the bones is akin to eating tender-young lobster, right off the boat. A recipe for cooking this fish, assuming you could get a good sized, yellow or bluefin tuna head from a fish monger, is equally as hard to find. It seems to be a specialty known to only a few. To my amazement, she telephoned from Tokyo and we enjoyed an hour-long conversation about Japanese cooking. She explained her current work on a cookbook entitled Kansha, celebrating the traditions of Japanese vegan and vegetarian cooking, and asked if I would join her Advisory Council as a tester of recipes she invented and methods she developed. I would receive monthly packets of information to be tested for: (1) availability of ingredients in my geographic area; (2) ease of comprehension; (3) ease of preparation; then report back cooking results and photographs of my efforts. I was quite intrigued. Frankly, I threw myself into the program, going whole hog, purchasing the finest ingredients I could find and following instructions to the letter. This went on for more than a year until other obligations overtook my time to the point that I could only watch the progress of the cookbook as it might come in Elizabeth’s informative monthly newsletters (http://www.tasteofculture.com/). Udon Noodles and Veggie-Radish dishes cooked and photographed by yours truly in my kitchen. This journey is one of a very different kind; one that Elizabeth made, surely, but her kindness opened doors for me I never expected. To have one’s efforts appreciated by the author is so encouraging. Kansha, the Japanese word for thanks-gratitude, reminds us of all that we have in our lives for which we are grateful. I am grateful this Thanksgiving to be inspired by Elizabeth Andoh. Kansha. What a wonderful “side trip” to Japan for this Thanksgiving. Thanks, so much, Bill for sharing this experience with us! I am so grateful to you for continuing to share your delicious spiritual journey. It continues to be marked by frequent, overwhelming episodes of appreciation, an unmistakable ability to enjoy each moment and an increased susceptibility to love extended by others accompanied by the uncontrollable urge to extend it further.